AccuraCast SearchStarz Blog: It's Valentine's Day and Google kindly reminds us! It's Valentine's Day and Google kindly reminds us! 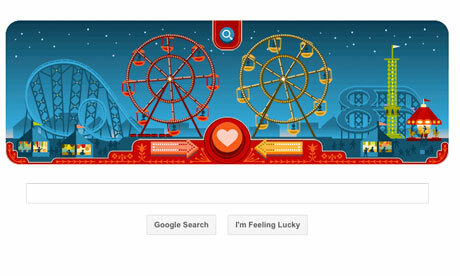 Today’s Google Doodle celebrates Valentine's Day with a picture of a fairground scene, including two Ferris Wheels. When you click on the heart you'll see two animals going on a Valentine's date. How romantic! 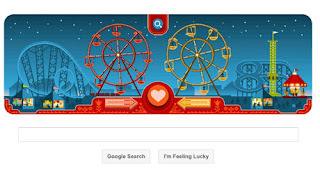 When you click on the search icon you'll get search results for George Ferris, who was born on Valentine's day in 1859 and is the inventor of the Ferris Wheel. The largest Ferris wheel in the world is 165 metres tall and is in Singapore. Best Medical App of All Time? New Facebook Smilies: A work in progress. Be Careful What You Put On Your Social Profiles!